Recombinant monoclonal antibody to CD200R. Manufactured using AbAb’s Recombinant Platform with variable regions (i.e. specificity) from the hybridoma OX131. Immunogen: Recombinant protein consisting of the extracellular regions of CD200R and CD200RLc together with rCD4d3+4 and attachment to streptavidin coated beads. Specificity: Mouse CD200R, an inhibitory receptor which is expressed on various leukocytes and delivers inhibitory signals upon engagement with its ligand CD200R1 and CD200R2. Note on publication: Describes the generation of the antibody, shows it blocks CD200/CD200R interaction by binding to CD200R (Uniprot Accession No. Q9ES57; Q9ES57.1). 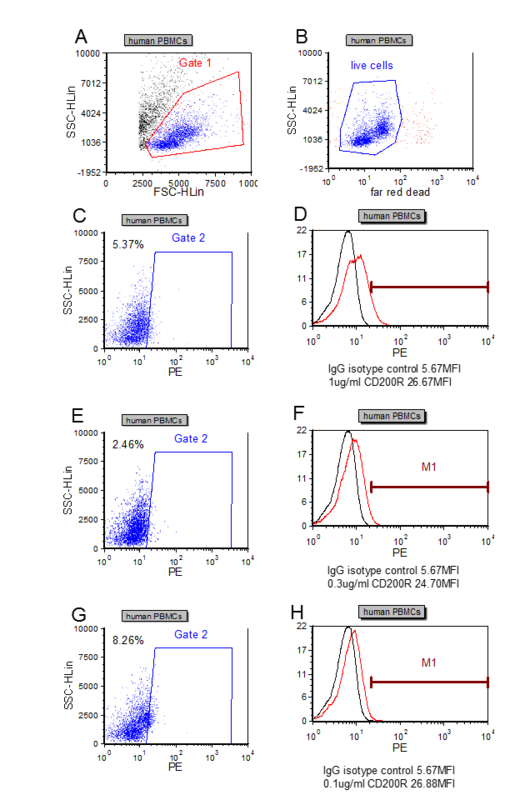 Human PBMCs stained with 1 µg/ml anti-CD200R (red) compared to isotype control (black). 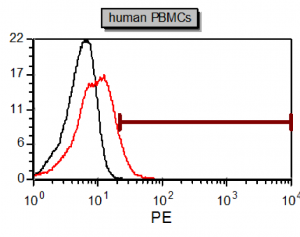 Flow-cytometric analysis of the dose-dependency (D, F, H) of anti-hCD200R antibody binding to live human PBMCs (B). The gating strategy is shown for control puposes (A, B, C, E, G).